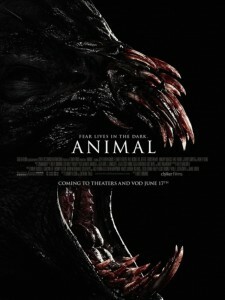 In some respects, Animal is a cut above the usual Chiller fare. It boasts a much better pedigree. It’s executive produced by Drew Barrymore and her Flower Films production company. The creature design and effects are by Gary Tunnicliffe (Scream 4, My Bloody Valentine, Feast). The music is by tomandandy (The Hills Have Eyes, The Strangers). The cast is full of familiar faces including Jeremy Sumpter (Frailty, Excision), Joey Lauren Adams (Chasing Amy), and Amaury Nolasco (2 Fast 2 Furious, Transformers). Unfortunately, in just about every other way it’s business as usual. From start to finish, for about 80 minutes, nothing out of the ordinary happens. The action is confined to one location because the budget is miniscule. The one-dimensional characters behave like you expect them to and die in the order you expect them to. The creature is actually not just a dumb animal but is herding and hunting them. It’s so depressingly lazy. After the opening credits we are right in the middle of a chase. Two couples are frantically running away from something in the woods. One of them doesn’t make it. Cut to two different couples and their fifth-wheel friend heading to a remote vacation spot. Two of them, siblings, used to go there with their family. Soon they are on foot, in the middle of nowhere, at night. They stumble upon the remains of the earlier victim and see the snorting, snarling creature that devoured her. The group makes a run for it after one of them is brutally murdered by the creature. They find a rundown old house and make it inside. The three survivors from the beginning just happen to be there. It’s here, the midsection, where Animal really lags and the wheels just spin and spin, killing time until the final confrontation. Characters bicker about whether to stay or run. Will help ever arrive? Who will distract it? Should they open the door for someone outside when the creature is out there? During this time the creature is rarely glimpsed. It’s very dull. Accepting the fact that there’s no way in hell the dilapidated structure would ever keep the ferocious, hungry, and powerful creature out (at one point we see two or three small boards blocking an open doorway; you or I could get through that in seconds), what is actually a pretty damn cool, practical monster is wasted. Most of the attacks and killing take place just slightly off screen (even in the theatrical, not edited-for-television version). Not to mention that the most shocking kill doesn’t even involve it. There’s not nearly enough creature action, and it isn’t because they try to keep it hidden for budgetary purposes. Chiller doesn’t seem willing to take any chances with their original movies, which is a shame. They keep churning out safe, predictable, tedious movies with very little variance in overall quality. In this instance that’s especially disappointing. Animal is a waste of a good, old-fashioned creature.